Embark on a brand-new, time-twisting adventure with LEGO Marvel Super Heroes 2 for Nintendo Switch, the sequel to the popular LEGO Marvel Super Heroes. Journey through time and space with your favourite Marvel heroes and villains in an exciting quest packed with signature LEGO hilarity. Realities and eras are no limit in this super fun time- travelling epic! Join your favourite Super Heroes and Super Villains as they take on the time-travelling Kang the Conqueror! 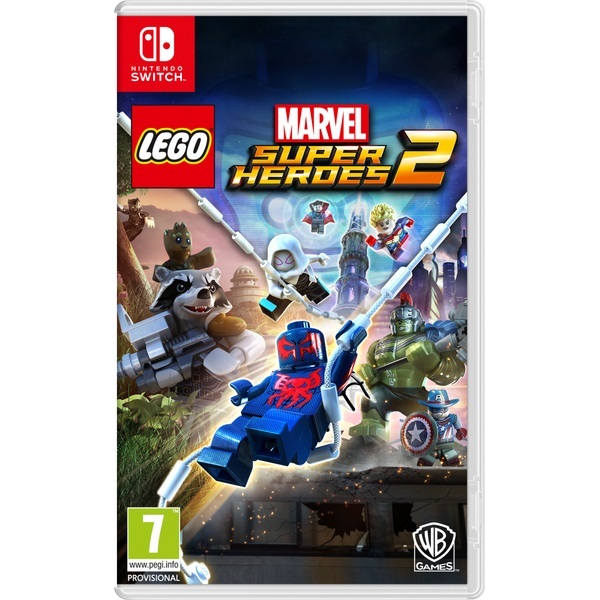 With LEGO Marvel Super Heroes 2 for Nintendo Switch, you can play as Spider-Man, the Hulk, Captain Marvel, Doctor Strange, the Guardians of the Galaxy and other Marvel Super Heroes and Villains. Step from the time-shifting city of Chronopolis into a world of adventure in epic Marvel locations such as Ancient Egypt, New York City in 2099, the Old West and Xandar, all coming together to form the Chronopolis Open Hub World. Players can roam through eras and realities in this expansive LEGO Marvel universe. In LEGO Marvel Supr Heroes 2 for Nintendo Switch, Spider-Man Noir and Spider-Man 2099 can finally meet. Should Cowboy Captain America run into the modern Captain America in this era-crossing adventure, hilarity is sure to ensue. The all-new time manipulation mechanic lets some characters turn time back and forth to change in-game elements, help players progress or uncover secrets. Super Hero battle mode allows up to 4 players to compete or cooperate in themed challenges and battle arenas, bringing tons of LEGO fun to all the family.